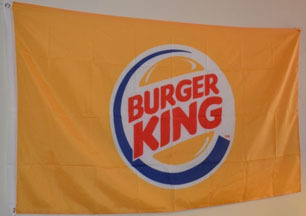 Burger King is a hamburger fast food chain of restaurants based in Florida that is one of the largest rivals to McDonald's. The company's flag features the corporate logo centered on a white field. The logo itself is meant to invoke thoughts of hamburgers, with the name of the company in red capital letters between two golden stylized hamburger bun halves, surrounded by a blue semi-circle.